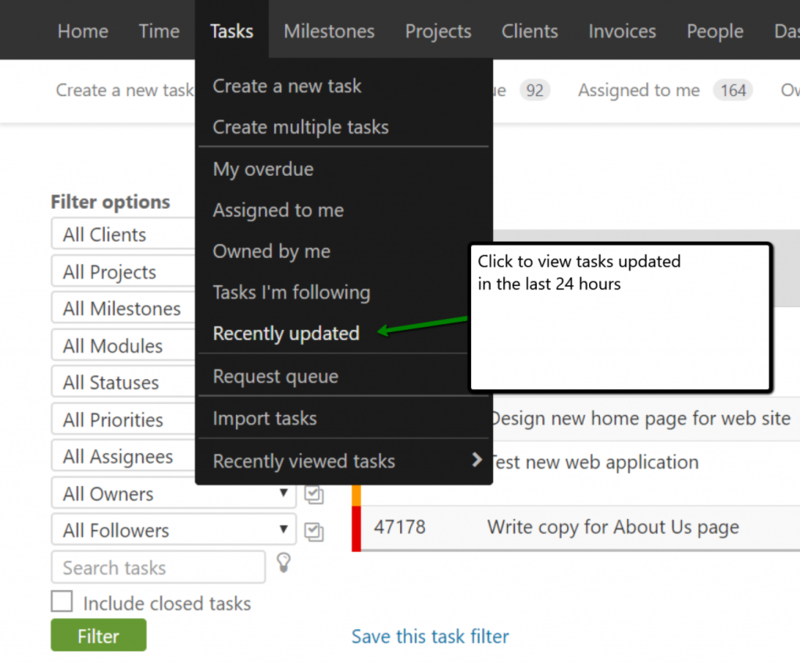 The submenu found under the Tasks tab has a link for viewing recently updated tasks. Click the link to filter the task listing and show tasks that have had a recent change, comment, or document uploaded, in the last 24 hours. The task listing will be sorted in reverse chronological order using the timestamp of the last update. In other words, the most recently updated tasks will appear at the top of the list. If 24 hours has passed since the task was last updated, it will be removed from the list. The eyeball icon denotes a task recently updated by another user that you haven’t yet reviewed. Click on the task and view its history to see what changed. Once you’ve reviewed the task the eyeball icon will be removed (until the task is updated again). 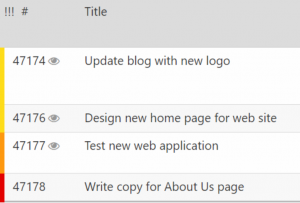 The eyeball icon shows up on all task listings found under the Tasks tab and on milestones. But, only if the task has been updated in the last 24 hours and you haven’t yet reviewed it. Once a task is no longer recent, the eyeball icon will go away whether you’ve reviewed it or not. It is not uncommon for a company to juggle more than a hundred tasks. Managing so many tasks at once can generate a high volume of notifications and correspondence, making it difficult to know which tasks need an immediate response, and which tasks can wait. Use the recently updated tasks page to focus only on what’s changed in the last 24 hours. 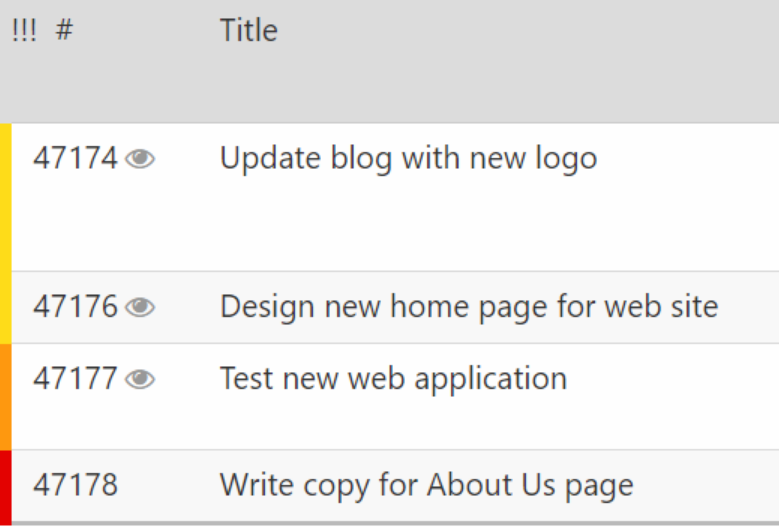 The eyeball icon will tell you which updates have yet to be seen, making it easy to skim the task listing. This makes it ideal for project managers who need to stay on top of the team’s progress. This feature has unlimited practical applications. 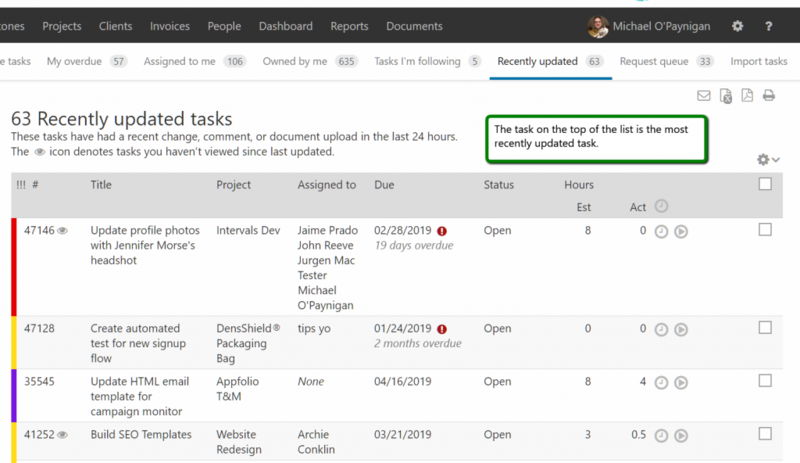 For example, if you are doing software development and using milestones for sprints, you can review the milestone’s task listing for a prelaunch check to avoid any last minute surprises. How do I change the sort order of the task list? How do I update tasks in bulk? How do I use the filters on the task listing?